Home > Does detox water really work? Does detox water really work? We live in an age where health and well-being are prized to the point of obsession. In that vein, detox water has begun to appear on healthy diet regimes more and more often. The hype surrounding suggests it offers a great many benefits. In this post, we take a closer look at what detox water is, what the associated pros and cons are, and whether this super trendy alternative is all it’s cracked up to be. Detox water is another name for fruit, vegetable or herb-infused water. The water can be made at home by adding fruit, vegetables, herbs, or a combination of all to tap or filtered water. Whatever you use to create your detox water, the mixture must be left to steep. The fruit, vegetables, or herbs should then be removed from the water – which can be refrigerated for up to three days. What are the benefits of drinking detox water? Infusing is often compared to juicing or blending. The flavour of detox water is generally tangier than if the juice from the fruit or vegetables was simply squeezed into the water as the infusion process takes the flavour from the rind. Detox water trumps juice in appearance too, providing a colourful and healthy look that’s more appealing to the eye. Detox water has a number of other health benefits, although many are yet to be backed by scientific evidence. It’s said to promote weight loss, remove toxins, balance the body’s pH levels, promote better digestion, increase energy levels, and improve your mood. How can I make my own detox water? Detox water is extremely easy to make at home, meaning you can harness all the advantages mentioned above and stay well hydrated easily and without breaking the bank. You don’t need any special equipment to infuse your own water and create a detox drink, although many people invest in an infuser bottle for added ease. You also don’t have to purchase any special ingredients, you can simply take a look in your fridge and improvise with the fruit, vegetables and herbs you already have. To create your own detox water, cut your ingredients into pieces and add them to hot or cold water. The combination of ingredients is entirely up to you, but remember the more you infuse, the stronger the flavour will be. Cold detox waters can be steeped for 1-12 hours. Ingredients must be removed after this time however to prevent decomposition. In a hurry but still want that strong infused taste? Crush or bruise the fruit, herbs and vegetables you want to use before adding them to water for a faster flavour release. 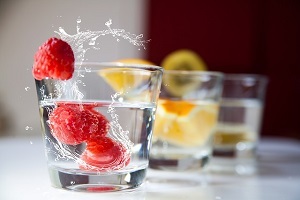 You’re certain to have your own preferences when it comes to your detox water recipe. Popular combinations to try include cucumber and mint, blackberry and orange, lemon and ginger, and watermelon and mint. Take a hint from the celebrity world by trying the super cleansing lemon and cayenne pepper detox water.